The free translation of Taman Mini Indonesia Indah (TMII) is Beautiful Indonesia Miniature Park. This is the most famous park recreation in Jakarta Indonesia, located in the land of Sunda. Although it is called miniature of Indonesia, the buildings are not so small such as Madurodam in Holland or Splendid China and Window of The World in Shen Zhen, China. Actually, these houses are built according to their original size, and since many traditional houses are occupied by several households, they are all big houses. Initially, the idea was to introduce Indonesian cultural diversity both to Indonesian as well as foreigners. Each province has one pavilion in form of their traditional house to showcase their unique art and cultures, such as local dances, traditional ceremonies, traditional clothes, tools and weapons, handicrafts, etc. 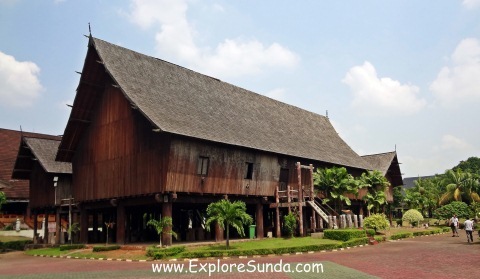 We can visit each of this pavilion and learn every culture in Indonesia. These pavilions were built around the center piece of Taman Mini Indonesia Indah: the Indonesian Miniature Archipelago. It is an artificial lake representing Indonesia archipelago, showing six main islands of Indonesia: Java, Sumatra, Kalimantan (Borneo), Sulawesi (Celebes), Lesser Sunda Islands, Maluku, and Papua. We can see a clear view of this archipelago from the cable car. Bring your camera, because there are many beautiful spots to capture. Nowadays Taman Mini Indonesia Indah has evolved into education park recreation. In addition to the traditional cultures, now TMII also exhibits other aspects of Indonesian, such as science, flora and fauna. Hence, it has many gardens and parks, museums, theatres, religious buildings, as well as recreation facilities. Let's explore them all now! Fyi, You may click any of the image below to go to specific page on the museums, recreation, garden and parks in TMII, or continue reading whereabouts in TMII and click the image in the bottom section of this page. TMII is a huge park that covers approximately 145 hectares. We are allowed to drive around TMII and park the car near the places we want to visit. This is the most comfortable way to enjoy TMII. Station A at the east of the south parking lot in the area of the Art and Handicraft Village. Station B near Papua pavillion and Bird Park. Station C at the north of the north parking lot, near Snowbay, the TMII water park. They will all pass the main lake, hence we can see the Miniature Indonesia Archipelago clearly from the sky. This is a mass passenger vehicle moved by wind power. The speed at TMII is only 15-20 km/hour so visitors can enjoy the view. It circles the main lake so we can see all of the pavilions. There are three stations where we can stop over: near the entrance, near the bird parks, and near Komodo Indonesian Fauna Museum and Reptile Park. It operates on Saturdays and Sundays. There are two miniature trains in Taman Mini Indonesia Indah: one is only circling Indonesia Children Palace up to Children Art Center and waterfall, while the other one goes around TMII. The later helps you see the landscape of TMII, all of the pavilions, gardens, museums, theaters, etc. If you like cycling, you can rent a bicycle in the right corner of the North Parking Lot, near the Art and Handicraft Village. TMII provides various bicycle for rent: children bicycle, MTB, and tandem. This is the free transportation provided by TMII. These open air mini buses are parked in the South Parking Lot of TMII. They run on two routes: the inner and outer lane. The advantage of this car is that you can hop on and off wherever you like, but it is not always available anytime we need it. Although individual guests are welcomed, most of the guests here are groups, either students field trip or companies outing. The rooms are in the form of barracks with several bunk beds in each room. This hostel is suitable for visitors with limited budget. This is the newest inn lodge facility in Taman Mini Indonesia Indah. If you prefer a more comfortable room with more hospitality, you can stay at Santika Hotel, a 3-star chained hotel. Although the location is not inside the park, it is just beside the main gate. It shares the yard with Green Terrace TMII, where we can dine in at several franchised restaurants. Bring wet tissues or hand sanitizer since the restrooms are very basic and hand basin is very seldom in TMII. I am sorry to say that having a decent meal in TMII is a bit difficult. The best one I would say the fast food restaurant besides the information center. The location is near the main gate. Alternatively, we could find fast food restaurants (fried chicken franchise) under the cable car stations. Other than that, there are some small canteens selling local cuisines and instant noodles. You also can find several franchised restaurants, such as A&W, Pizza Hut, Solaria, and JCo at Green Terrace TMII. However, the location is outside the main gate. Bring a picnic basket is hardly an option too, because there is no picnic ground in TMII. In addition to the kiosks spreads all over TMII, there are some bigger shops selling mostly handicrafts uniquely Indonesia. Even we can find a very rare old book in TMII! We can buy Indonesian souvenirs here. For example, Sundanese wayang golek (wooden puppet), wayang kulit (leather puppet), keris (traditional double-bladed dagger), paintings, leather, batik, bamboo handicrafts, etc. The location is near Sasana Kriya and the skylift station A. This is the place where Taman Mini Indonesia Indah supports the small enterprises and artisan to display and sell their products. Taman Mini Indonesia Indah has a unique place called Rare Books Market, where you can buy antique books. The price varies depending on the contents, author, published year and condition of the book, hence, it can be as low as ten thousand rupiah up to millions rupiah. The location is near Palace of Indonesian Children. It is very easy to go to Taman Mini Indonesia Indah from Jakarta. TMII is in East Jakarta, thus, you only need to drive through Jagorawi Toll Road and exit at TMII (km 5). 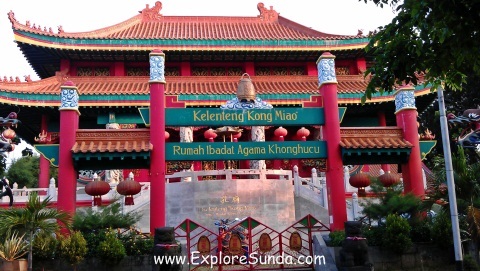 Then you will see many signs directing you to the main gate of Taman Mini Indonesia Indah. There is something unique in TMII, the gates open from 7am-10pm daily, we can go around the park or worship at the church, mosque or temple, but all of the pavilions, museums, theatres, and recreation facilities opens between 9am to 5pm daily. During the month of Ramadhan (fasting month) some of the attractions will close sooner. First we pay the entrance fee at the gate, both for passengers and the vehicle we use. Then we have to pay another entrance fee for each attraction we visit. These fees are vary, depending on the attractions.